All the ladies around the office have fine hair, so we're always looking for ways to pump up the volume. It's hard to find a product that's easy to use, provides long-lasting results AND enhances the health of hair. We think we've found the one with Rock Your Hair! All products are sulfate and paraben free and safe for all hair types. Products are the choice of many celebs and are featured at many award shows. If it's award-winning, it's gotta be good! 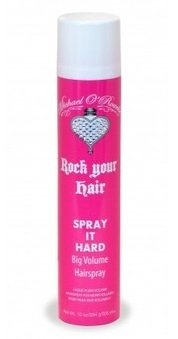 Rock Your Hair Spray It Hard Big Volume Hairspray gives you bigger, thicker hair with long-lasting workable hold. It also adds shine to your hair and won't flake. Living in Central Texas, we're always fighting humidity and frizz. Rock Your Hair 3 Day Blow Out Blow Dry Extender fights humidity and frizz, protects your color against thermal damage, adds shine, and smooths the hair cuticle for softer hair. Of course, it also extends the look of your blowout with its unique memory system, keeping hair looking fresh. Often when we want to smooth hair or add shine, we go for a hair serum. These can sometimes leave the hair feeling too greasy or heavy. The solution? Rock Your Hair Moringa Dry Oil Mist. The Moringa oil is full of antioxidants and nutrients, and has shown greater benefits than Argan Oil. Not only will it tame frizz and add shine, it also repairs split ends, protects against thermal damage and color fading. It's spray formula is lightweight and super nourishing. Rock Your Hair Hard Gel is a favorite among men for its flake-free, super firm hold formula. It's perfect for spiking the hair or slicking it back. For long hair or kids hair, the Leave-In Conditioner Weightless Detangler will make your haircare routine so much easier! It strengthens hair while repairing damage, adding shine and easing tangles. Which Rock Your Hair product are you most excited to try? Let us know! 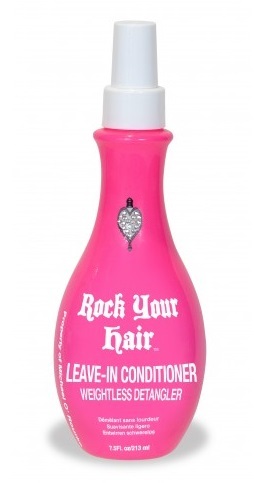 FREE GIFT OFFER: Receive a free travel size Spray It Hair Hairspray with $40+ purchase of Rock Your Hair products.